Nephrosis - body, causes, What Is Nephrosis?, Whait Causes Nephrosis? Nephrosis (nef-RO-sis), or nephrotic syndrome, is a kidney disease that causes the body to lose protein through the urine. Loss of protein results in edema, loss of appetite, and general tiredness. Nephrosis cannot usually be cured, but it can be treated with medication and diet. During the summer when Sally was seven years old, she stopped eating much of anything at meals, lay around the house all day, and seemed too tired to do her chores or play with friends. At first Sally's mother thought Sally was just being lazy, but when Sally's whole body began to look puffy, especially her eyes, ankles, and abdomen, her mother began to worry. The doctor identified Sally's puffiness as edema * , and asked Sally about how often she had been going to the bathroom. When Sally said she was urinating only about twice a day, the doctor suspected a kidney problem. The doctor ran several tests: an analysis of Sally's urine showed that it contained high levels of protein; a blood test showed low levels of protein and high levels of cholesterol. These results made the doctor suspect nephrosis. The doctor performed several additional tests to eliminate other diseases, then he confirmed the diagnosis with a kidney biopsy. Ultimately, he could not figure out why Sally had developed nephrosis. He explained to Sally and her parents that her condition could not be cured, but that medications and a low-fat, low-salt diet would help relieve the symptoms. * edema (e-DEEM-a) occurs when excess fluid collects in tissues causing the hands, feet, and other body parts to swell abnormally. If nephrosis leads to kidney failure, dialysis may be necessary. 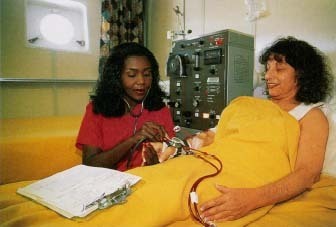 Here a person on a cruise receives dialysis with the assistance of the ship nurse. blood. The filtering units in the kidney are called glomeruli (glom-ER-you-li). Nephrosis is a kidney disease caused by a defect in the glomeruli. When the glomeruli are damaged, the filtering mechanism does not work properly. Instead of keeping proteins in the blood, while allowing excess water and wastes to pass through the filter into collecting tubules where they become urine, the glomeruli filters leak. This allows proteins to move out of the bloodstream with the water and wastes, and to be excreted in the urine. Loss of large amounts of protein from the blood allows fluid to leak out of the bloodstream into the body's tissues. The retention of fluid gives the body, especially the face and legs, a puffy and bloated appearance. Diabetes, when the body cannot produce sufficient amounts of the hormone insulin to regulate the amount of sugar in the blood. Systemic lupus erythematosus (sis-TEM-ik LOO-pus er-i-them-a-TO-sus), sometimes just called lupus, which is a chronic inflammatory disease that can affect the kidneys and other organs. Amyloidosis (am-i-loy-DO-sis), a condition in which a protein called amyloid collects in the tissues and organs. Myeloma (my-e-LO-ma), a tumor derived from bone marrow cells. Glomerulonephritis (glomer-u-lo-ne-FRY-tis), also called Bright's disease, a condition in which the glomeruli become inflamed and scarred. In addition, overuse of some drugs, exposure to certain chemicals (for example lead or carbon tetrachloride), and in some people, exposure to certain allergens (poison ivy, poison oak, insect stings) can affect the functioning of the kidneys and lead to nephrosis. What Is the Treatment for Nephrosis? How nephrosis is treated depends on its cause. If it is caused by another disease, that disease is treated. If the cause of nephrosis is not known, the symptoms may be treated with drugs to reduce inflammation in the kidneys, diuretics * to reduce edema, and antibiotics to stop infection. A diet low in fat and salt might be recommended, and fluid intake might be restricted. People with nephrosis often recover when the disease causing the nephrosis is treated. People with nephrosis, however, may be at increased risk for other kidney diseases. If the kidneys lose their ability to function, dialysis may be necessary. * diuretics (di-yoo-RET-iks) are drugs that increase the production of urine and help the body get rid of extra water. U.S. National Kidney and Urologic Disease Information Clearinghouse, 3 Information Way, Bethesda, MD 20892-3580. This division of the National Institute of Diabetes and Digestive and Kidney Disease, s (NIDDK) posts a fact sheet about nephrotic syndrome at its website. I'VE HAD NEPHROTIC SYNDROME FOR A LONG TIME AND JUST RECENTLY MY FEET FEELS TIGHT QUITE OFTEN. DO YOU THINK THIS IS FROM MY KIDNEY PROBLEM.